Moonen Shipyards announces that it has signed a letter of intent to build the first 24m hull of a new series of superyachts. Available in 18-, 20- and 24-metre versions, the new series of motor yachts is designed as for a new generation of Moonen owners. The series has been created in partnership with Moonen and designer Nick Mezas, who won a ShowBoats Design Awards 2011 Young Designer of the Year Judges Commendation for his project R&R. According to Moonen, the series was conceived in response to clients seeking, 'a cool new Moonen.' The yachts in the new series come in smaller than the Dutch yard's normal stock, and this order is placed on the heels of delivery of its largest yacht to date, the 42m, submarine-equipped Sofia. But the smaller size – and lower price point – along with the more aggressive and modern exterior styling are designed to appeal to a younger yacht owner. The first to be built in the new series, the 24m Mallorca range, features design by Nick Mezas with naval architecture by Diana Yacht Design and interior design by Van Helmond|Zuidam Architecten. She will be built in aluminium with a round-bilge hull and will be powered by twin MAN V8-900 engines fitted with Volvo ZF4000 propulsion achieving a top speed of 22 knots. She will feature an open-plan layout on the main deck connecting the saloon and wheelhouse, and the master cabin and three guest staterooms can be found on the lower deck. To complement this new smaller-superyacht series, Moonen has also rolled out a range of contemporary displacement yachts designed in collaboration with Rene van der Velden. 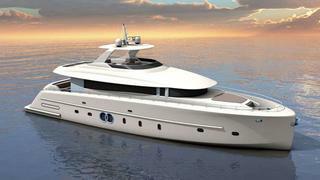 The 42- and 49-metre yachts aim to come in under 500GT.